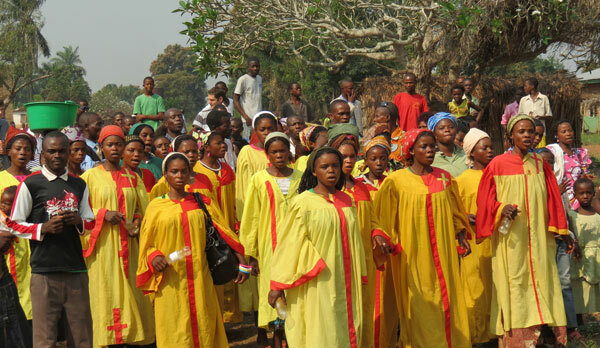 The Chorale Grand Tam-Tam (Big Drum Choir) walked nearly 100 miles to participate in the centennial celebrations of the Communauté Mennonite au Congo (Mennonite Community in Congo) July 16-22. Fifty-some young musicians walked nearly 100 miles carrying their drums, luggage and a few babies to attend the centennial celebration of Communauté Mennonite au Congo—CMCO (Mennonite Community in Congo), July 16-22. For a week, the choir members from Djoko Punda, one of the first Mennonite mission stations in this central African country, travelled along rugged paths through forests and savannas, crossing rivers on make-shift bridges and spending nights in school rooms. Chorale Grand Tam-Tam (Big Drum Chorale) arrived in Tshikapa, the headquarters of this Mennonite denomination, to lead Mennonites from three continents in praise for “100 years of evangelization and cultural encounters,” the CMCO tagline for the occasion. In his opening address, the CMCO president, Adolphe Komuesa Kalunga, named weaknesses and failures in the missionary approach of those who came to Congo through Africa Inter-Mennonite Mission and its predecessor agencies in his historical overview of Mennonite history in Congo—paternalism, a heavy focus on the spiritual with less concern for conditions that oppressed the Congolese people, and a reluctance to trust the Congolese church with financial management. However, Komuesa also acknowledged with gratitude these same missionaries, hundreds of them, who were faithful to God’s call to share the good news Jesus—braving sickness, a harsh climate, difficult living conditions and political instability. Komuesa asked the gathered assembly to stand for a moment of silence to remember all the Mennonites who sacrificed their lives in obedience to Christ’s call. Missionary accomplishments were only possible because Congolese people worked hand-in-hand with their brothers and sisters from the North America, Komuesa said, in congratulation to his church for their solidarity. Today, CMCO is a member of Africa Inter-Mennonite Mission that brings together eight partners, including Mennonite Church Canada Witness. Approximately 400 participants gathered for the final worship service on Sunday, July 22. Many of them held candles lighted in celebration of CMCO’s birthday. “Dear brothers and sisters in Christ, in the second century that begins today, take care of our church,” was Komuesa’s birthday wish, as the candles were extinguished as a symbol of the end of CMCO’s first centennial anniversary. During the week-long celebration, CMCO’s story was communicated in many forms—through original songs in the tradition of griots (singer-historians), through a book of short biographies of early Congolese Mennonites, through a PowerPoint program presented by François Tshidimu Mukendi, a Mennonite pastor and historian, and through many examples in sermons and testimonies. “CMCO has been doing God’s work for 100 years starting in 1912,” sang the Chorale Evangélique Mennonite de Dibumba (Evangelical Mennonite Choir of Dibumba). “Today, we are here to thank God. 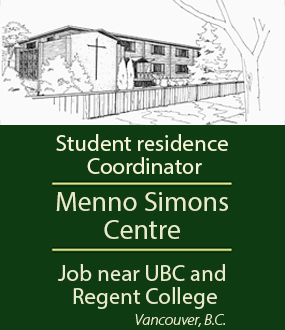 Now, we are many Mennonites. May we work in unity to spread the good news of Jesus.” In succeeding verses, the choir went on to describe how eight mission stations were built. Today, although some of the mission station buildings have crumbled into disrepair, the church has thrived, growing to include 110,000 members, 798 congregations, 95 schools and 7 hospitals, according to a conference given by Anastasie Tshimbila, a professor at the Mennonite Bible institute in Kalonda, about five miles from Tshikapa. The most passionate debate at the celebration centered on the decision to ordain women. 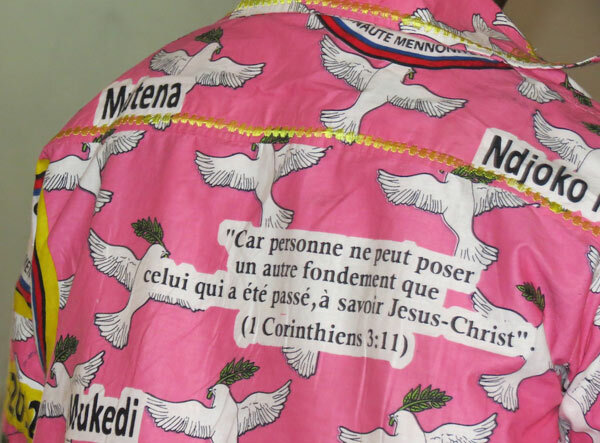 Of the three Mennonite denominations in Congo, CMCO was the only one still denying ordination to women. La Communauté des Frères Mennonites au Congo (the Mennonite Brethren Church) ordained its first woman pastor in 2000. Communauté Evangélique Mennonite (the Evangelical Mennonite Church) was preparing to ordain its first woman pastor a few days after the end of CMCO’s centennial celebration. Komuesa was given the mandate for his second six-year term as CMCO president just hours before the centennial festivities began, as the annual general assembly concluded around 2 a.m. on July 15. Among Komuesa’s accomplishments in his first tenure was the construction of a welcome centre, which includes a large conference room, a dining room and kitchen, and three dormitory blocks. The new facilities enabled CMCO to receive 30 delegates from three continents representing eight Mennonite agencies (see sidebar). Because the center is within walking distance from the airport, CMCO hopes that it can be used as a guest house to generate income for the church. The welcome centre was a collaborative effort that included Africa Inter-Mennonite Mission, CMCO, building teams from Mennonite Church USA congregations and Arnold Harder, who traveled to Congo four times for a total of six months of volunteer service to facilitate the construction process. Executive coordinator of Africa Inter-Mennonite Mission, Rod Hollinger-Janzen, coordinated the international component of the Congolese anniversary event. He said that the experience communicated how profound relationships within the body of Christ can be. He was moved by the affirmation that choirs from different ethnic groups—Tshokwe, Lulua and Pende—gave each other. People, who had been feuding a few decades ago, were now singing about being brothers and sisters. “This was one way the centennial celebration became an avenue for CMCO members to reaffirm their unity in Christ, and accept their ethnic diversity as a positive and creative reality,” Hollinger-Janzen said. He said that CMCO leaders and members repeatedly expressed the desire to continue to nurture fraternal relationships and to partner with the church conferences and agencies which had worked together to plant Mennonite churches in Congo. Lynda Hollinger-Janzen is a writer for Mennonite Mission Network of Mennonite Church USA. 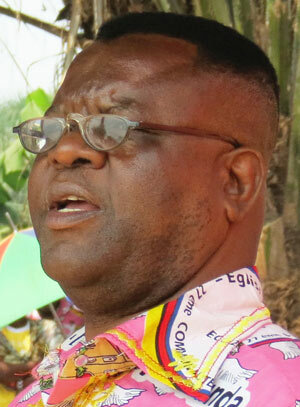 Adolphe Komuesa Kalunga, CMCO President. Menno Simons’ favourite verse was chosen for the cloth commemorating the centennial celebrations. The eight original mission stations of what is today Africa Inter-Mennonite Mission are also printed on the cloth.